Chomp Chomp is so famous for food that somehow you got to pay a premium for the name at most of the stalls we patronised, and you get the portion likely much lesser than other food centres. What to do, reputation can really makes a difference sometime. 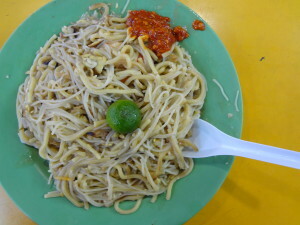 Chia Keng Hokkien Mee is one of the famous stalls in this food centre from the recommendation by the media and the awards displayed at the stall. 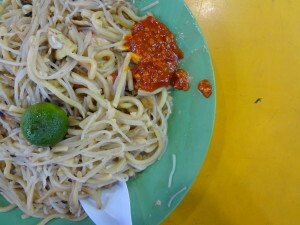 Logically, we joined the queue for this sinfully high cholesterol food. 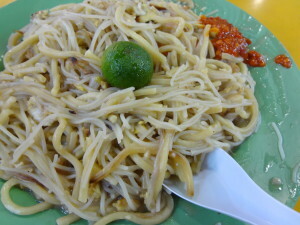 Good Hokkien mee can’t triumph without the lard and the way how the stock is prepared with the stewed noodles, the prawn stock in the Chia Keng Hokkien Mee was rather distinct, to the point that we found the noodle was absorbed too much of the fishiness from the stock and getting a little over pronounced. The noodle was relatively soggy and the amount of eggs and seafood somehow not too evident, not sure was it part of the cost cutting measure or the uniquely characteristic of Chia Keng Hokkien Mee. Anyway, there is still a group of faithful followers of this Hokkien mee stall and that is exactly the different opinions by the taste buds making our life so colourful. 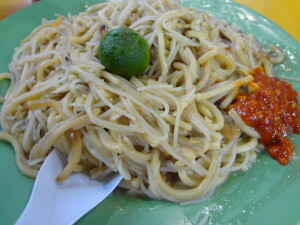 Rahim Muslim Food – Power mee rebus ?